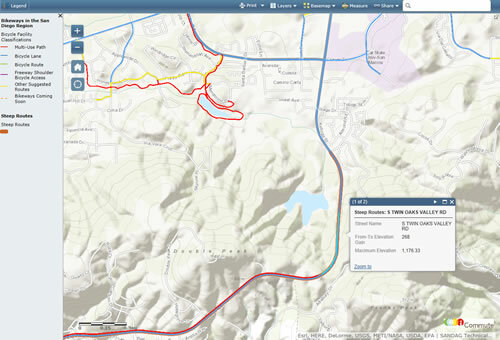 A new bike route map app powered with Esri ArcGIS will take you places in San Diego County. The San Diego Regional Bike Map displays in detail the area's 1,340-mile bikeway network, including designated bike lanes and multiuse paths. The app shows you where to find (or avoid) steep climbs and where to locate parking and lockers. The San Diego Association of Governments (SANDAG) developed the app to support sustainable transportation. Read the article and see the map app in action. The blue, green, red, and yellow lines denote bike routes and multiuse paths in San Diego County. Want your Esri Story Map app to attract more viewers online, including members of the Esri Story Map team? There are some tips and tricks to this. Perhaps your Story Map will even end up being featured in the Story Map Gallery. Whether you sell coffee, manage major transportation hubs such as ports, or try to eradicate diseases such as polio, GIS technology is making a difference in the way you work. Read this story about how some major organizations that presented at the Esri User Conference use GIS in a big way. Esri president Jack Dangermond says that by acting on our imagination, we can create a new and better future. And fundamental to this idea is the concept of geodesign. Read his article. Explore the United States from California to the New York island using the USGS Historical Topographic Map Explorer app, which brings to life more than 178,000 maps dating from 1884 to 2006. Esri ArcGIS was used to create the app. Read the article. Members of the US House of Representatives use a 3D GIS mapping application to tour potential office suites. Read this article to find out who created the interactive app and how it works. Communities need good demographic, lifestyle, and consumer spending data on residents to help revitalize an area and bring in new businesses. Read the article. Ask questions, toss around ideas, and share information about all things geo at Esri's new community site, GeoNet. Get involved in more than 250 industry-, product-, and user-created places and start chatting today. Where will the US population grow? Where will disposable income be high and low? What areas will become more diverse? Esri's new 2014/2019 Updated Demographics data provides this type of accurate information. Geodesign Summit Europe will return to the Netherlands from September 11–12, 2014. The summit will focus on how geodesign can play a pivotal role in making European communities smarter, safer, and more resilient. Read the article. How do diverse businesses, like The Wendy's Company, Con-way Freight, and Lululemon, use GIS and location analytics? Executives from those companies shared their stories at the Esri Business Summit. Read this article. Explorer for ArcGIS is now available for Apple users who want to discover, view, and share maps from their Mac desktops. Download the app today from the Mac App Store or ArcGIS Marketplace. Use elevation data in your GIS applications by tapping into Esri's two world elevation dynamic image services, Terrain and TopBathy. All you need is an ArcGIS organizational account. Esri just released the Multi-Directional Hillshade in ArcGIS Online. You can add it to your desktop or web apps. Read the blog. Esri's Suzanne Foss and Vinay Viswambharan demonstrate the capabilities of ArcGIS Pro, an application that will be included in ArcGIS 10.3 for Desktop. Which ArcGIS Online basemap best works with your map or app? Read this blog and access a matrix to use to make your selection. Using the ArcGIS ModelBuilder application, you can open any model tool, change settings, and quickly run the model to test alternative scenarios. A useful technique to quickly change tool criteria and rerun a model outside of ModelBuilder is to add model parameters. Learn how in this article. Esri chief scientist Dawn Wright talks to ECO magazine about Esri's support for science using GIS and a variety of initiatives. More than 150 organizations from around the world took home a Special Achievement in GIS Award from Esri this year. Find out who won. The next generation of Esri Tapestry Segmentation tells you all about the demographics and lifestyles of every US neighborhood. Join thousands of others interested in geospatial technology for Esri's massive open online course (MOOC) in spatial analysis starting September 3, 2014. Learn more and watch the video. 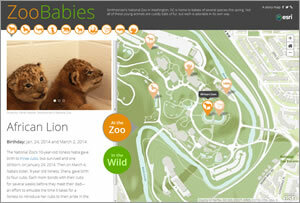 Esri announces the winners of its Storytelling with Maps Contest. See where the winners hail from using what else? A story map. Esri's Linda Hecht interviews Richard Saul Wurman about the Urban Observatory and where it will go next. Find out how the Recovers, WorkHands, and thrdPlace apps use GIS maps to promote volunteerism, ready communities for natural disasters, and help skilled trade workers find jobs. 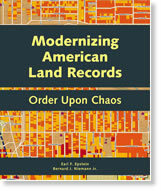 Modernizing American Land Records offers a historical and modern view of American land systems. 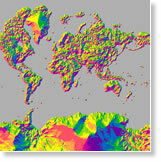 It considers the opportunities when technology is properly used to connect rights, restrictions, and responsibilities with the location of land features. Buy the book. Both the GeoCollector for ArcPad and GeoCollector for ArcGIS for Windows Mobile high-accuracy data collection solutions have been updated to include Trimble's new Geo 7X handheld with an optional range finder module. Learn more about all Esri and Trimble offers.